Pedestrians and drivers using Kingswinford High Street in Dudley are being confronted by the biggest political poster in the UK - at least we think it is the biggest poster. 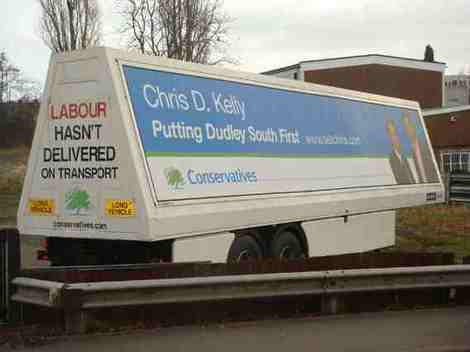 "This is an innovative means of communicating with the people of Dudley South for which no taxpayer funded Parliamentary 'communications allowance' or trade union funds have been used. I want to make myself easily accessible to local residents which is why I have put my contact details on the posters. 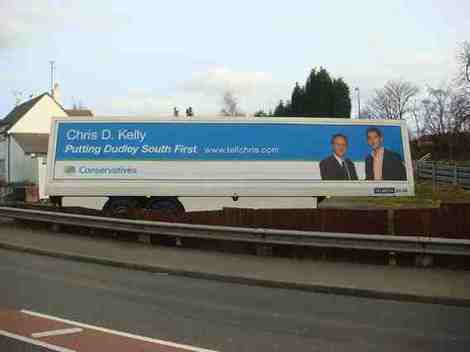 Residents can send me their views via my website, tellChris.com." If you are pursuing an interesting campaign idea or tool please tell us about it.